Crunchy is my name for a guy who's always at the library, who one time when I was there was eating a bag of cereal. He had the inner lining bag from the cereal box out and was making loud crunching noises and laughing. I wrote about him here. That was "Surveilling Crunchy," which seemed like an interesting thing to do at the time, but in the meantime I've given up all interest. Now I try to keep my head down and mind my own business. Fortunately we haven't had a repeat performance of the cereal bag incident, since it was very distracting. Still, to me, he'll always be Crunchy, or the more formal name I gave him, J. Wellington Crunchford II. Since I'm out now on a roadtrip, out of town/out of state, I was thinking I ought to go to the local library and see if Crunchy is a type who reappears everywhere. I'm thinking there's always mythological substratums, types, figures who fill the role of gods and demons, at least aspects of their personalities and qualities, maybe on a smaller scale, in the larger whole of existence. It's what makes life so wonderful, that you're part of a larger drama. But I wonder what makes me the observer and not myself a more intrinsic type. Of course I'm not telling the whole story, mostly because I don't know it (1), and (2) that would be something I would be more protective of anyway. OK, I haven't gone to the library here in this other town. But let's say that I did, except I'm pessimistic as to the Crunchford type being there. So, to make it happen, I myself assume that role. I dress like him, frizz out my hair, what I have left of it, and, more importantly, show up with a box/bag of cereal. Then as people around me are studiously looking at their books, I take a handful, crunch it, rattle the bag, walk over to the stacks, and back to my table, a repeating cycle of about 35 seconds, over and over. I don't know that I could be oblivious enough to the sensibilities of the others around me to make it happen. It'd be hard to prolong it, since my natural thing is to do my munching with great discretion. I'd rather chew in slow motion and with keen attention to my jaws, that no one would know I had a mouthful of something. OK, but in this telling of the story, I throw caution to the wind. "Crunch, crunch, rattle, rattle, giggle, chuckle, laugh." To the stacks and back. Another guy, the type of actual me there, with his back turned, thinks, "What is it with this crazy guy," and immediately tags me with a ridiculous name, to himself privately of course. Except, and here's the kicker, in this little picture he appears! There actually is the Crunchy type at this out of town library! He may look different from the other guy, since you can't depend on body doubles, but he approaches me, wild-eyed, and literally with a bag of cereal. He breaks character, since his character is observant but with a heavy dose of obliviousness. He breaks character long enough to call me to one of the unofficial stacks, a netherworld within the library mysteriously beyond the numbers of the decimal system, and explains to me that this is his territory. My character is such that I would want to know that he's all right. His character has that far-off look that "I'm beyond reach." But in that private area, where we both set down our cereal and look into one another's eyes, and all is revealed, I determine he is all right and knows his own mind. We talk over our respective parts in the psychological scheme of things. We clasp shoulders, I give a friendly wide-handed pinch to his elbow. He tells me in a good faith voice that he hears there's an opening at the Knoxville library, which would really be contradictory to our prior understanding of our parts in the psychological scheme. But am I doomed to be simply me? Couldn't I trade roles? Why would I want to? I set my cereal down. He runs his hand over his face, top down, transforming his visage from present with me to oblivious and fairly blank, at least feigned. Then back into the public stacks he goes! 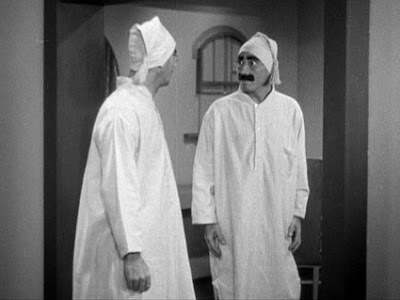 The picture -- The Marx Brothers picture I almost forgot. Of course that represents two apparently identical types meeting and scoping one another out. A quick thrust of the fist would solve the dilemma, but sometimes life demands a more slow motion, feeling out approach.